Peter Durack was described by his greatest adversary in the Senate, Gareth Evans, as 'a man of genuinely Liberal reformist instincts'. Committed to the protection of individual rights through the limitation of executive power, and to preventing the erosion of the rights of the states by federal encroachment, as Attorney-General in the Fraser Government from 1977 to 1983, Durack oversaw a significant period of reform in Australian administrative law. Peter Drew Durack was born in Subiaco, Perth, on 20 October 1926, the only child of lawyer John Peter (Jack) Durack and his wife Pleasance Sarah, née Rowe. During the interwar period, Jack Durack, KC, was 'the doyen of the Western Australian Criminal Bar'. Peter was a grandson of 'Galway Jerry' Durack, of the pioneering Durack family documented by Mary Durack in Kings in Grass Castles (1959). Peter received his primary education at Anglican schools—St Andrew's, Subiaco, and St Mary's Girls' School, West Perth (which took boys in its junior classes). He then had a Catholic education at the Christian Brothers College in St Georges Terrace, Perth (known as 'CBC Terrace') from 1937 to 1940, and its affiliate, Aquinas College, Salter Point (1941–43). A student at the University of Western Australia (UWA) from 1944, Durack graduated as a Bachelor of Laws with second-class honours in 1948, winning the H. C. F. Keall Prize, awarded to the top fourth year student, in 1945. As an undergraduate, inspired by Robert Menzies' announcement of the formation of the Liberal Party in February 1945, he co-founded the University's Liberal Club (1945), and was president in 1946. Durack was a member of the UWA inter-varsity debating team (1946–47), and president of the National Union of Australian University Students (1948–49). At UWA Durack was a 'prominent anti-Communist' who 'never wavered in his belief in the anti-communist and anti-socialist liberal causes'. A Rhodes scholarship in 1949 enabled Durack to attend Lincoln College, Oxford University, to study for the postgraduate degree Bachelor of Civil Law (BCL), which he passed with second-class honours, achieving the top mark in equity. After completing the BCL, Durack tutored in law at Keble College, Oxford, and was admitted to the Bar of Gray's Inn, London, in 1953. He met Isabel Arnott Milne at Oxford, and the couple married in Edinburgh, Scotland on 23 March 1953; Isabel became a senior lecturer in Medieval History at UWA. On returning to Perth, and following admission to legal practice on 18 May 1954, Peter Durack joined Dwyer Durack & Dunphy, the law firm co-founded by his father in 1915. He was appointed Queen's Counsel in April 1978. At the 1965 state election Durack won the Legislative Assembly seat of Perth for the Liberal Party, defeating the sitting Labor member by 207 votes. In his first speech in the Assembly Durack discussed administrative law, a subject which would remain a central concern for the rest of his political career. He pointed out that the 'constant increase in the activities of Governments and in the laws and regulations' saw, 'more and more, a demand by the ordinary citizen for expert legal advice and assistance'. Durack was disturbed by the 'great deal of legislation in this State ... which restricts the right of legal representation of the ordinary citizen before various tribunals. That, I feel strongly, is quite contrary to principle'. Durack also expressed the hope that Perth town planners would 'always have regard ... to the preservation and extension of the natural beauties of our city'. Subsequently, Durack crossed the floor on two environmental issues: in 1965 he supported an Opposition bill seeking to amend legislation to ensure that any requests to reclaim the Swan River gained parliamentary approval. The bill failed by one vote. In the following year he was one of several Liberals who crossed the floor to defeat a motion to remove the Barracks Archway. Defeated at the 1968 state election, Durack did not regret leaving the WA Parliament, which at that time sat for only four months of the year, and had virtually no functioning committees. He was elected president of the WA Liberal Party in 1968, serving in this role until 1971. Early in 1969 Durack contested pre-selection for a by-election for the federal seat of Curtin but lost to R. V. Garland (MHR, Curtin, 1969–81). At the 1970 half-Senate election long-serving Liberal Senator Malcolm Scott was not preselected, and George Branson did not nominate, presenting Durack, selected at the top of the ticket, and the only Liberal senator elected, with 'an armchair ride' into federal politics. He was re-elected at the 1974 double dissolution election from third place after senators Reg Withers and Peter Sim. Thereafter, he was re-elected from second place on the Liberal ticket, behind Withers in 1975 and 1980, and Senator Fred Chaney in 1983 and 1987. I believe that it will be necessary in the future, much more than in the past, for Parliament to create administrative tribunals of a semi-judicial character ... which will be available to provide rights of appeal for the citizen against decisions of the Executive Government, insofar as those decisions are concerned with private rights or obligations conferred by legislation. During his first year in the Senate Durack joined six parliamentary committees, including the Standing Committee on Constitutional and Legal Affairs, which he chaired from March 1972 to February 1973. Durack participated in that committee's comprehensive inquiries into divorce law and the clauses of the Whitlam Government's Family Law Bill 1974. The committee's unanimous recommendation of the introduction of no-fault divorce was subsequently enacted in November 1974. Durack was a prominent participant during the final debates on the bill, drawing on his own experience as a solicitor to argue that the case for no-fault divorce based only on irretrievable breakdown of the marriage was 'overwhelming'. His amendment seeking to make the required period of separation before divorce two years, rather than one year, did not pass. More than ten years later, in December 1985, Durack put forward as a private senator's bill a Family Law Amendment Bill which sought to remedy problems with maintenance orders. The bill passed in the Senate in May 1987 but did not progress further. Victorian National Party, and later Liberal Party, Senator Julian McGauran noted that the Hawke Government's Family Law Amendment Bill 1987 implemented 'most of the major provisions' introduced in Durack's private senator's bill. Durack was Opposition spokesman for Postmaster-General matters from June 1974 to November 1975. His first ministerial post, as a member of the Fraser Government, was as Minister for Repatriation from July 1976. The department was renamed Veterans' Affairs in October 1976 and Durack remained minister until September 1977 (he was also briefly Minister for Administrative Services during August 1978). As Minister for Veterans' Affairs, he oversaw major changes in the repatriation system recommended in the Toose report, including changes to appeal mechanisms for veterans, implemented through the Repatriation Acts Amendment Act 1977. From August 1978 to March 1983 Durack served as Deputy Leader of the Government in the Senate. The high-water mark of Durack's involvement in administrative law reform, and of his political career, was his term as Attorney-General in the Fraser Government, from September 1977 to March 1983. Appointed to the post following the resignation of Robert Ellicott, Durack sustained the momentum for law reform begun under the Whitlam Government, and continued by Ellicott. A considerable amount of legislation carried through by Durack was initiated by Ellicott, in the same way that Durack's immediate successors, Labor Attorneys-General, Gareth Evans (1983–84) and Lionel Bowen (1984–90), would bring to fruition measures originated by Durack. The Administrative Appeals Tribunal Act 1975, the Ombudsman Act 1976 and the Administrative Decisions Judicial Review Act 1977 (ADJR Act) were the principal legacies of previous Attorneys-General, allowing Durack to further promote individual rights, although progress was sometimes slow and tortuous. The ADJR Act was not proclaimed until late 1980, due to the gradual additions to a schedule of exemptions from the giving of reasons. As the exemptions were sought by ministers, Durack found that many 'had to be resolved by Cabinet'. Durack was 'determined that these exemptions should be as few as possible'. He believed strongly that providing people with reasons for a decision 'particularly if it goes against them' was 'most important'. In June 1978 Durack introduced the Freedom of Information Bill 1978, which sought to give Australians, for the first time, legally enforceable rights to access government-held information. Again the question of ministerial and departmental exemptions proved difficult to resolve, and so, although it was supported in principle by the ALP, the measure took three years to pass through Parliament. This legislation was described in 2008 by Prime Minister Kevin Rudd as 'one of the most notable changes to civil liberties in Australia'. The Australian Security Intelligence Organisation Act 1979, enacting a major overhaul of ASIO, established a Security Appeals Tribunal to hear complaints from persons who had received an unfavourable security assessment. The Complaints (Australian Federal Police) Act 1981 provided an independent review by a federal judge of complaints of misconduct by the Australian Federal Police. In March 1981, while introducing a bill to establish the Human Rights Commission, Durack spoke of the 'need for more effective machinery to promote human rights in Australia'. He also noted that the measure would 'help Australia to discharge the obligations' it had assumed through ratification of the International Covenant on Civil and Political Rights in August 1980. The High Court of Australia Act 1979, enacted in anticipation of the Court's move to Canberra the following year, gave the High Court 'responsibility for its own administration'. The Act also included provision for the federal Attorney-General to consult state Attorneys-General on appointments to the court. Durack's recommendations for appointment to the court, of Ronald Wilson (1979), Gerard Brennan (1981), William Deane (1982), and Daryl Dawson (1982) were seen to be merit-based, and generally recognised as sound. In November 1973 Durack had been one of nine Coalition senators who voted against the second reading of the Seas and Submerged Lands Bill 1973 [No.2]; he argued that the legislation, establishing the Commonwealth's control of off-shore Australian waters, was of 'such importance' to the future of federalism that it should be determined by consultation with state governments, and 'should not be solved solely by the Australian Parliament'. In 1980, as Attorney-General, he introduced a package of bills including the Coastal Waters (State Powers) Bill and the Coastal Waters (State Title) Bill, which, when enacted, reversed the Seas and Submerged Lands Act 1973 by extending state legislative powers over territorial sea to three miles from the shore. The bills represented, according to Durack, 'the use, for the first time since federation' of a constitutional provision, section 51(38), under which all the states could pass legislation requesting the Commonwealth to act to extend state powers. Durack commenced his second reading speech by describing the measures as 'historic' and 'a great milestone in Commonwealth-State relations'. The Labor Opposition took a very different view. Labor's Senate Leader, John Button argued that the bills were 'vastly to the detriment of this country' and were 'historic' only in the sense of taking Australia back to the pre-federation era. Senator Gareth Evans began by stating: 'This legislation represents an act of collective constitutional vandalism'. Durack considered the legislation to be one of his most important parliamentary achievements. The same constitutional provision, section 51(38), was cited again by Durack in 1982, with the aim of abolishing residual colonial constitutional links with the United Kingdom, including, in particular, direct appeals from Australian courts to the Privy Council. Durack believed 'that all Australian appeals should be settled in Australia by the High Court'. To that end, the Premiers' Conference, held in June 1982, adopted a resolution requesting that the Commonwealth introduce legislation ending residual links. Negotiations with the states over other aspects of the proposed legislation were still unresolved when the Fraser Government lost office in 1983, and abolition of residual links, including appeals to the Privy Council, was finally carried through by the Hawke Government's Australia Act 1986 and parallel legislation enacted in the United Kingdom, with Durack giving 'wholehearted support' to the legislation. Between 1982 and 1983 the Fraser Government negotiated fruitlessly with Robin Gray's Tasmanian Liberal Government, attempting to persuade the Tasmanians not to press ahead with a controversial plan to dam the world heritage-listed Franklin River. Durack, committed to co-operative federalism, did not wish to use the Commonwealth's external affairs power to enforce international treaties to overrule the Tasmanian Government, and Fraser was of the same mind. In 1983 legislation prohibiting work on the dam passed by the newly-elected Hawke Government was contested in the High Court, which found that the legislation was constitutionally sound. The Court found that as Australia was a signatory to the UNESCO Convention, and UNESCO had listed the Franklin River as a world heritage site, the legislation was valid under the external affairs powers of the federal government. These developments dismayed Durack, who feared that the external affairs power allowed 'no limit to the range of matters that may come within the legislative power of the Commonwealth'. In September 1984 he introduced a private senator's bill, Constitution Amendment (External Affairs) 1984, which proposed an amendment to section 51(29) of the Constitution to provide that the external affairs power would only apply if the subject matter of the relevant legislation was substantially related 'to other countries or to persons, matters or things outside the Commonwealth'. The bill lapsed in 1987. In 1980, on Durack's recommendation, the Fraser Government appointed Frank Costigan QC to conduct a royal commission into the activities of the Federated Ship Painters' and Dockers' Union. While it investigated widespread racketeering by union members, Costigan uncovered evidence of 'bottom of the harbour' tax avoidance schemes (by which companies were stripped of assets to avoid tax liabilities). The royal commissioner also found serious incompetence, negligence and misconduct in the way in which the Deputy Crown Solicitor's Office in Perth dealt with these cases, resulting in the particular proliferation of such schemes in Western Australia. Treasurer John Howard, who had legislated to criminalise 'bottom of the harbour' schemes two years earlier, announced that he would introduce legislation to retrospectively recoup revenue lost through those schemes since 1972. Durack was put under immense pressure on two fronts: he was assailed in both Houses by the Labor Opposition over his responsibility for entrenched shortcomings in the Crown Solicitor's Office; he also faced considerable anger in his home state over the Treasurer's retrospective taxation measures, with the added complication that some prominent members of the WA Liberal Party were alleged to have been involved in 'bottom of the harbour' schemes. On 25 August 1982 Senator John Button moved a motion censuring Durack and Howard over 'the administration of legislation relating to criminal and civil offences against the tax laws resulting in multi-billion dollar frauds against the Commonwealth' and calling for the resignation of both ministers. Durack refused to resign: he accepted that he and the Treasurer had a 'general responsibility' for taxation laws but argued that they had discharged their responsibilities effectively. The censure motion was negatived on a tied vote. A few days later, Durack said that 'in the Australian system, ministers do not resign unless some personal [i.e. not departmental] failing is involved'. In the Senate the Opposition continued to hound Durack, and on 8 September Gareth Evans raised as a matter of public importance: 'The long history of delay, neglect, incompetence and mal-administration in the Attorney-General's Department under Senator Durack'. Within a week, Durack suffered a mild heart attack. In August he had introduced legislation to set up a National Crime Commission; the legislation passed but was not enacted before the March 1983 election. Durack was later a firm supporter of Labor's 1984 legislation to establish the National Crime Authority. Following the defeat of the Fraser Government in the 1983 election, Durack held shadow portfolios on Attorney-General matters (1983–84, 1992), resources and energy (1984–87), and defence (1990-92), serving under the leadership, respectively, of Andrew Peacock, John Howard and John Hewson. He was Deputy Leader of the Opposition in the Senate from 1983 to 1987 and from 1990 to 1992. He maintained a close involvement in committee work, believing that committees were a means by which the Parliament could 'perform its historic and fundamental role as the instrument to control the Executive Government'. Having initially doubted the value of a Scrutiny of Bills Committee, he joined that committee in 1983, recognising its role in identifying the possible impact of bills on individuals. Durack introduced motions for the appointment of both the Senate select committees set up during 1984 to investigate claims of misbehaviour by High Court Justice, Lionel Murphy. Durack was also a member of the first committee and, together with Liberal colleague, Senator Austin Lewis, he issued a dissenting report, finding that there was a prima facie case against Murphy on the basis of an alleged conversation between Murphy and the NSW Chief Stipendiary Magistrate, Clarrie Briese. At the conclusion of the complex and prolonged Murphy saga—which involved a further investigation by the Director of Public Prosecutions, followed by two court cases—a parliamentary commission consisting of three retired judges was investigating additional allegations against Justice Murphy when news of Murphy's terminal illness saw the Hawke Government put an end to the commission's work. The bill repealing the commission contained stringent provisions to prevent evidence heard by the commission ever being disclosed. Durack expressed 'the Opposition's utter abhorrence and rejection of the attempt by this Bill to suppress forever any allegations' made against Murphy: 'This action by the Government can be seen only as an attempt to promote Mr Justice Murphy in his lifetime to the pantheon of the Labor gods'. Durack was consistent throughout the Murphy case in his belief that: 'In the end that question [of what constitutes misbehaviour] must be determined by Parliament ... Parliament has to accept its responsibility'. In May 1992 Durack was dropped from the Liberal WA Senate ticket for the 1993 election as the result of disruptive factionalism in the Western Australian branch, although his age—he would have been sixty-six by the time of the next election—was given as the reason by party sources. At the time of his retirement on 30 June 1993 he was the longest-serving member, or 'Father' of the Senate. After leaving Parliament Durack continued to write and speak on legal and constitutional matters. In 2005 the Commonwealth Law Courts Building in Perth was renamed the Peter Durack Commonwealth Law Courts Building, and when the High Court sits in Perth, it does so in that building. 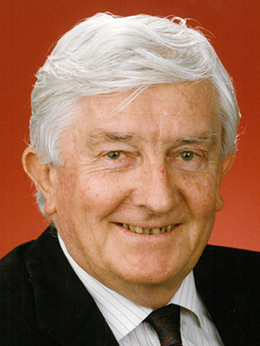 Peter Durack died in Perth on 13 July 2008. His wife Isabel died on 30 August 2015. Speaking after Durack's death, Malcolm Fraser said that his 'qualities would have carried him into any cabinet', and that he was a 'very gentle person, but he spoke fearlessly'. Senator Fred Chaney, who worked closely with Durack, remembered him as 'the best political and legal mind I ever worked with'. Durack's achievements as a liberal reformer in the Australian Parliament were embodied in his belief that 'Democratic government must not only act according to law (that is, process) but should also be concerned that the rights of individuals are part of the outcome and that each of them is given a fair go'. CPD, 27 May 1993, p. 1505; Ian Viner, 'Peter Drew Durack [Obituary]', 20 Aug. 2008; author interview with Isabel Durack, 18 Dec. 2013; Mary Durack, Kings in Grass Castles, Constable & Co., London, 1959; Kalgoorlie Miner, 7 Dec. 1948, p. 4; Catholic Weekly (Syd. ), 13 July 1950, p. 4; David Black & Geoffrey Bolton, Biographical Register of Members of the Parliament of Western Australia, Vol. Two, 1930–2004, rev. ed.,WA Parliamentary History Project, Perth, 2004, pp. 61–2; WA (Perth), 27 May 1993, p. 29. WAPD, 10 Aug. 1965, pp. 187–190, 3 Nov. 1965, pp. 2052–60, 24 Nov. 1965, pp. 2864–5, 2993, 18 Oct. 1966, pp. 1462–8, 1530–68; CPD, 27 May 1993, p. 1517; CT, 25 March 1970, p. 1. CPD, 8 Sept. 1971, pp. 571–5. Standing Committee on Constitutional and Legal Affairs, Report on the Law and Administration of Divorce and Related Matters and the Clauses of the Family Law Bill 1974, Canberra, 1974; CPD, 26 Nov. 1974, pp. 2774–6, 2789–90, 2793–4, 30 Oct. 1974, pp. 2141–3, 2153–5, 14 May 1987, pp. 2850–4, 5 Dec. 1987, pp. 2979–82, 17 Dec. 1987, pp. 3389–90, 26 May 1977, pp. 1428–30, 7 March 1979, pp. 597–600. Peter Durack, 'The rise and rise of administrative law', Australian Journal of Administrative Law, Vol. 8, Aug. 2001, pp. 147–50; Peter Durack, 'A victory for the rule of law', Alternative Law Journal, Vol. 20, No. 5, Oct. 1995, pp. 220–4; Peter Durack, 'Parliament and people', Papers on Parliament, No. 18, Dec. 1992, pp. 93–109; Robin Creyke, '"Better decisions" and federal tribunals in Australia', Australian Law Reform Commission Reform Journal, Issue 84, Autumn 2004, pp. 10–14; CPD, 9 June 1978, pp. 2689–703, 10 March 1981, pp. 422–4; CPD (R), 26 Aug. 2008, p. 6185; Oxford Companion to the High Court of Australia, OUP, Melb., 1992, p. 323; CPD, 14 Nov. 1979, pp. 2289–91; Australian (Syd. ), 13 Dec. 1995, p. 17. CPD, 27 Nov. 1973, pp. 2134–8, 13 May 1980, pp. 2122–9, 2599–622, 2 Dec. 1985, pp. 2682–5; Peter Durack, Australian Year Book of International Law, 1983, pp. 259–60; CPD, 30 April 1981, p. 1543, 2 Dec. 1985, pp. 2682–5; CT, 26 June 1982, p. 1, 3 Dec. 1985, p. 12. CPD, 12 Sept. 1984, pp. 858–60. Malcolm Fraser & Margaret Simons, Malcolm Fraser: The Political Memoirs, Miegunyah Press, Carlton, Vic., 2010, pp. 586–8; Peter Grabosky, Wayward Governance: Illegality and its Control in the Public Sector, Australian Institute of Criminology, Canberra, 1989, pp. 143–59; CPD, 24 Aug. 1982, pp. 406–8, 25 Aug. 1982, pp. 457–70; CT, 26 Aug. 1982, p. 12; Australian (Syd. ), 28 Aug. 1982, p. 4; CPD, 7 Sept. 1982, pp. 618–23, 628–37, 8 Sept. 1982, pp. 689–93, 18 Oct. 1983, pp. 1644–50, 17 Nov. 1983, pp. 2726–34, 4 June 1984, pp. 2444–8. CPD, 8 Sept. 1971, p. 572, 19 Nov. 1981, pp. 2418–20; Papers on Parliament, Dec. 1992, p. 95. Senate Select Committee on the Conduct of a Judge, Report, Canberra, August 1984 (dissent); CPD, 5 Sept. 1984, pp. 460–4, 21 Aug. 1986, pp. 195–9; CT, 21 Aug. 1986, p. 1, 18 Sept. 1986, p. 3. SMH, 11 May 1992, p. 4; CT, 11 May 1992, p. 16; CPD, 27 May 1993, pp. 1505–18, 1555–6, 1599–610, 26 Aug. 2008, pp. 3662–9; CPD (R), 26 Aug. 2008, pp. 6185–7; Australian (Syd. ), 16 July 2008, p. 7; Peter Durack, Alternative Law Journal, Oct. 1995, p. 224. This biography was first published in The Biographical Dictionary of the Australian Senate, Vol. 4, 1983-2002, Department of the Senate, Canberra, 2017, pp. 478-484.